Here's my monthly update of the Federal government's finances. After some 18 months of improvement, during which time spending was restrained and revenues grew at a respectable rate—thanks to rising employment, strong productivity growth, strong corporate profits and a rising stock market—spending has once again perked up, sending the 12-month deficit to $1.4 trillion. The recent budget agreement will do little to change the reality of a looming fiscal trainwreck. 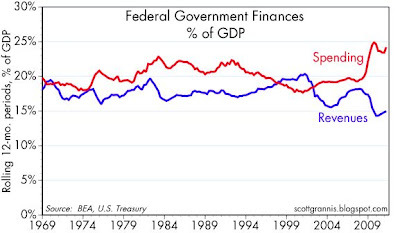 And even if the fiscal gap is eventually closed via higher taxes, the burden of government, as Milton Friedman taught us, is found in spending, not taxes or borrowing. If the government continues to spend 25% of GDP, the impact on the economy will not be mitigated by taxing more and borrowing less. Indeed, taxing more would probably be harmful to the economy in the long run, since it would immediately reduce the after-tax incentive to work and invest. 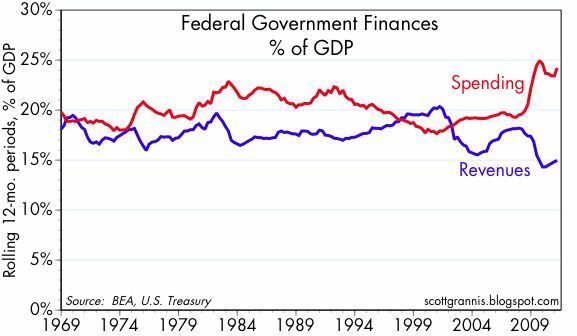 Plus, as my mentor Art Laffer always used to say, if you had the choice of paying more taxes to the government or buying Treasury debt, wouldn't it be much better to lend the government the money? At least then you would have the hope of getting your money back, and with interest. 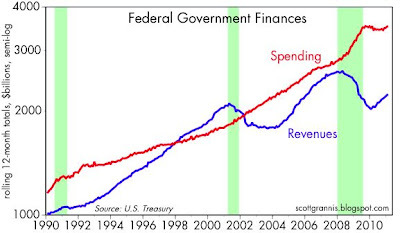 In the end, whether the government borrows 10% of GDP or taxes an extra 10% of GDP, the federal government will end up spending the extra money in a way that will surely be less efficient and more wasteful than if the money had remained under the control of private interests. Friedman also reminded us that you never spend someone else's money as frugally and wisely as you spend your own. The long-term outlook for the economy will only improve to the extent Congress is able to restrain the growth in spending. As I've pointed out before, simply freezing spending at current levels would balance the budget in about 5 years. I think this can be done, and I think the recent budget agreement was the first step in the right direction. I note that the whole nature of the fiscal debate has changed 180º: the question now is how much and what to cut, not whether to cut spending. Consider Obama's amazing chutzpah when he praised the recent deficit reduction, just months after proposing the most outrageous deficit-ridden budget in recent memory. Now, who is going to whack away at those top seven agencies (in terms of employees)? Curtail pensions for those top seven agencies? I have a plan to eliminate more than 500,000 federal employees without the slightest difference to our standard of living or security. 1. Eliminate all USDA employees. 2. Eliminate all VA employees, and give veterans medical vouchers (the Ryan plan in a new context, and not bad). 3. Eliminate all Homeland Security employees. I can assure you, no one in Congress will back my plan. The Tea Party? Do they even know the shape of federal spending? I wish I could be as optimistic as you about this budget, fought for so hard with so little to show for it. Yes, I realize the debate has changed, but will the good fight continue after this round? Will there be a next round, and will it be for more than another token sum? Even the Ryan Plan allows growth of 2.8% over the next decade -- not absolute cuts. I'll take it over the Obama Plan, without hesitation, but we've got to keep pushing for real cuts -- and fast! Thanks for these graphs. But top it off with a Govt Spending/Revenues one. 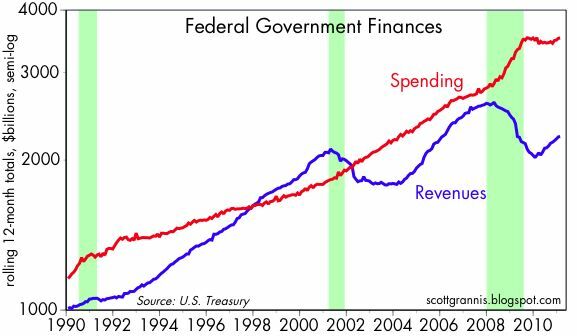 This will show how much the government is overspending on its own terms. This one will be very startling. Don't you think you are a little late? How does one NOW "prepare" for inflation? Buy a truck load of grains? Stock up the garage with beans, rice, canned goods, and boxes of cereal? Were you buying the oil producers, the tree farmers, and or gold and silver back in 1999-2001? If not, how do you now protect yourself from inflation? Lori, the way to prepare for inflation is to unload all variable debt, and convert all bonds to dividend-paying stocks and/or rent-paying properties -- yes, buying gold and silver would have been a good idea back in the 1990's, but that is old news at this point -- the great inflation has already started by the way -- watch and learn -- good luck! Great Laffer quote! Never thought of that way. 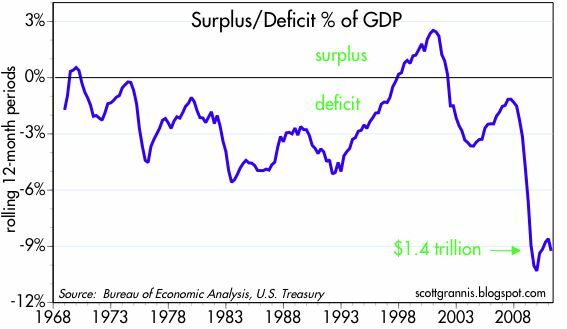 When I think of the National US Debt I wonder how great things would be if the total debt of $14T was credit/surplus. Can u imagine the lobbying that would be going on? Since the current round of inflation measured by the price of hard assets began in 1999/2000, I prefer to "learn" about inflation from someone who did not miss out on the current price inflation in silver, gold, crude oil, and tree farmers that started back then. So, how late were you a buyer into said inflating assets?